Featuring a blog in Magento store is becoming more popular and not only because of SEO: the more knowledge you share with your customers — the more credibility your company or brand gains, thus you are likely to increase your conversion rate and build a strong audience of returning clients. And now let us touch a sensitive topic which is also a subject of many holy wars between Magento developers and marketers: blog extension for Magento or WordPress integration? We are not going to give a definite answer to this. Instead, we will cover a few pros and cons of each option and, hopefully, help you choose the right solution. The main question to ask yourself before diving into technical details is what you are going to use your blog for? Will it be just a post or two a week (or even a month) or you want to share your news and articles very frequently? Are you going to feature your blog posts on Magento homepage or product pages, or include products into your blog posts? The thing is integrating Magento and WordPress might seem quite easy at the first glance, but we have never had a 100% smooth integration. If you are absolutely sure you need a standalone blog — be absolutely sure to invest time and effort to integrate the two platforms together. Yes, with WordPress you will get a full control over your blog, a user-friendly admin interface to manage content, ability to install any theme, any plugin or widget, sliders and galleries, and an overall scalability. But on the other hand you will get two systems to maintain and two systems to upgrade in the future. In addition, let’s not forget that WordPress is still one of the most vulnerable platforms, and finding a loophole in it may turn fatal to the whole Magento store it’s integrated with. Another important thing to mention is that Magento and WordPress integration doesn’t really integrate these two systems: your customers will still need to have separate logins, header and footer will not be dynamically updated (if, suppose, you have a drop-down shopping cart in the header). And although there is a way to implement this via other add-ons, you really need to think if it will make sense in your case, as the amount of suffering to achieve the goal might be higher than the expectations from the end result. The first option is the most popular one — FishPig extension for Magento. It comes for free and allows to integrate Magento products into WordPress posts, WordPress header into Magento, WordPress posts into Magento pages and many other things (which you might not need :)). It also adds a Magento WordPress auto-login: once logged into Magento backend you can just click a link that will open your WordPress blog in another tab without the need to log in there. At Fishpig website you can find a lot of useful documentation on setting up the integration, as well as information about various shortcodes, association products to blog articles, etc. Besides, there are other helpful add-ons like integrated search (to search both WordPress articles and Magento products, +£49.99), customer synchronisation (single sign-on in both systems, £49.99), root add-on (basically allows to create CMS pages from WordPress, including the homepage, £49.99) and a few others. There’s also one interesting add-on for £49.99 for multi-site integration that allows to assign an individual blog to each of your Magento stores. The tools provided by FishPig are cool, you will just have to make them work together, so may the force be with you! One more tool for Magento and WordPress integration, and in this case it’s a WordPress plugin. It’s a bit more interesting than FishPig because together with Shortcodes add-on ($18) it allows to pull blocks of Magento into WordPress and create a very smooth experience for your customers: you can pull menu, categories, mini-cart, footer etc. Single Sign-on is available as a separate add-on for $42 at codecanyon.net. James, the author of MWI plugin and its add-ons, is very helpful with his replies to user comments. This might be just the right thing to use for your blog if the mere purpose of it is to post an article every now and then and not worry too much about the look and feel. The extension allows to display latest posts, excerpts, tags, categories, guest comments, etc. Users report that it needs some tweaks at times, but overall a good module to work with and it comes for free. Also, AheadWorks are known to keep a very good quality of their products, so don’t be afraid to go for a free extension like AheadWorks Blog in case you have quality-related concerns. 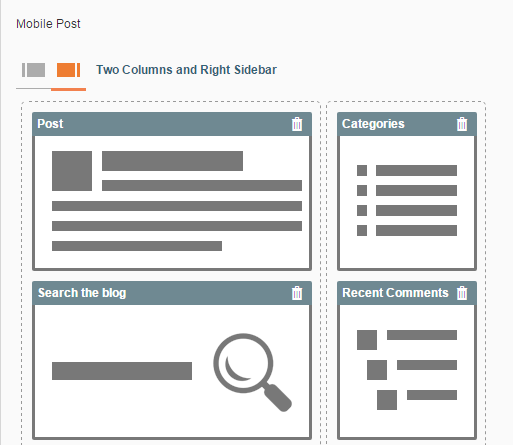 Another solution to implement a blog inside Magento without the need to integrate anything. Compared to AheadWorks, it has more features including customer group filtering, Facebook commenting, layout control, delayed publish date, URL-rewrites for SEO. It has standard features as AheadWorks and Nblog offer like categories, tags, URL-rewrites, automatic or manual comment approval, latest posts, plus a few other cool features like meta-information for categories and tags (not only posts), notifications about the comment added, notifications about post publishing, customer notifications about comments and replies in the thread, sitemap and import from WordPress and AheadWorks blog. WYSIWYG editor is very convenient, so is the image upload function. Judging from the comments on MagPleasure website, users who bought this extension are quite happy and point out a very helpful support. Hope this article has made your agony of choosing a bit better. Always analyze and make decisions best for your needs, because any best practice may prove wrong in your specific situation. For any further information contact us – Magento development experts. Happy blogging!